CHEF is the most popular configuration management tool in the market these days as CHEF turns infrastructure into code and you can do almost anything using it. Recipes are the heart of CHEF. OpsWorks has been gaining a lot of momentum for last few months, the major factor being its support for CHEF. So, in this blog we will be discussing how we can can manage users on multiple machines and their permissions as well. You will see how easy it is to do so and manage all the configurations as well. The recipes I have used can be shared can be used independent of OpsWorks with minimal changes. I had multiple users on my machines. Whenever there was a new user who joined the firm to give him access on those machines I had to manually go and add the user to that machine. Also, adding the user to a group was necessary so that permissions could be managed at the level of groups. So, I had to think of a way out and to manage all this through one click using CHEF and OpsWorks. We will be using a CHEF recipe and passing values to those using Opsworks data-bags and deploying the configs using one click deployment in OpsWorks. What OpsWorks does is that it creates a copy of your GitHub repo locally to itself and then executes the recipes when we specify which one to execute. 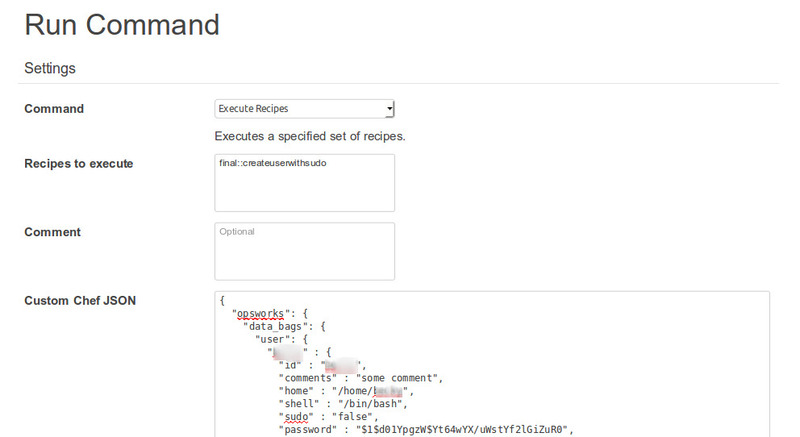 Since, we are using data bags in our recipes, we will give input values to them as JSON through OpsWorks. The above script will create users based on the JSON values we pass in OpsWorks. It will create a .ssh folder inside the home directory of the user as well and append the ssh-keys inside the authorized_keys file. 1. 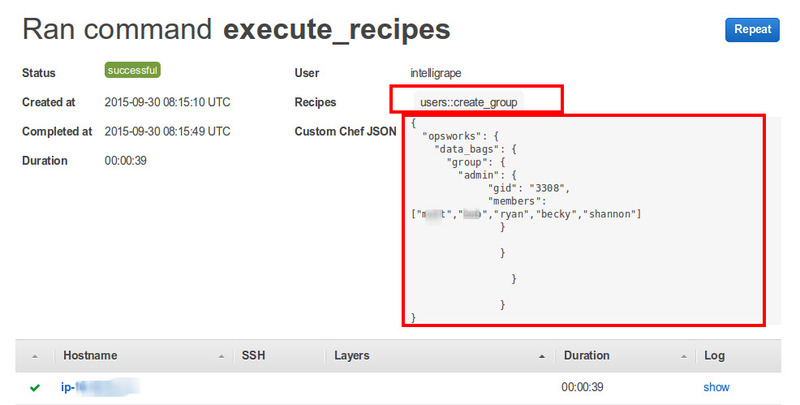 Creating a user on servers according to Recipe 1 and giving input to the recipe using OpsWorks. 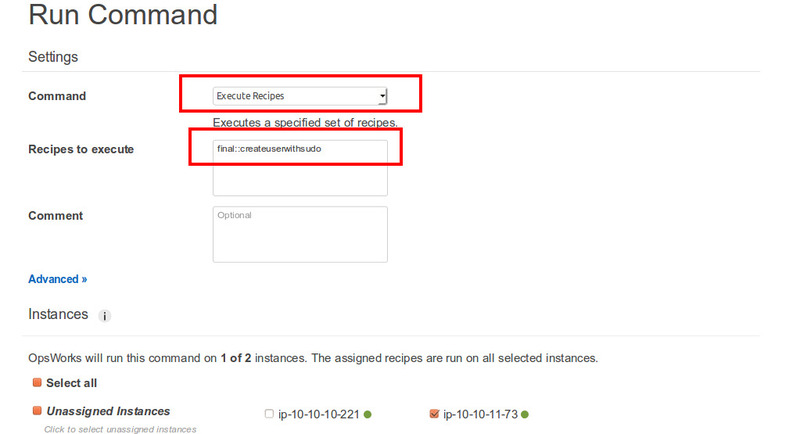 Select Execute Recipes from the drop-down and enter the cookbook name and recipe name as shown in the image.We are using cookbook named “final” and recipe named “createuserwithsudo”. When entering them in the Recipes to execute box use “::” (two colons) to separate them. 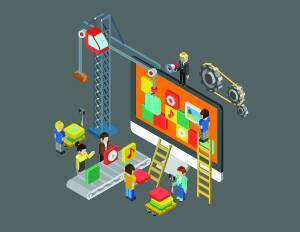 The user will be created on the specified servers. 3. Handling the file inside sudoers.d to give different permissions. You need to make changes to the recipe according to your use case and names of files. 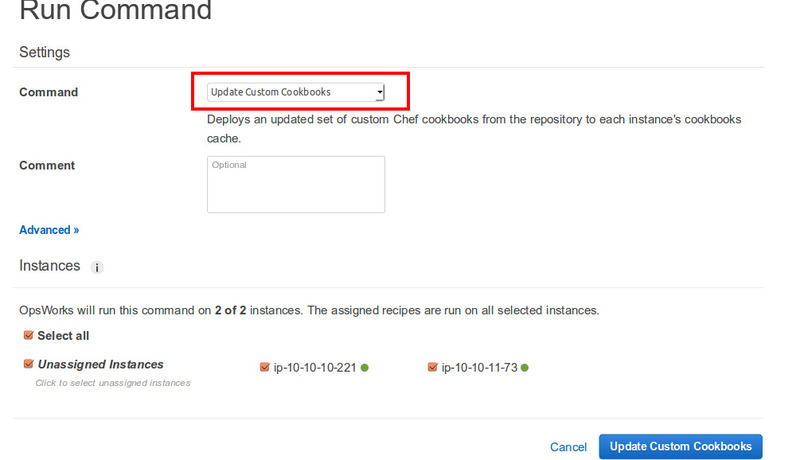 In case you make changes to the recipe make sure you run the Update Cookbooks command as I have shown in step 1. This is the basic way of handling users on your servers using CHEF. In my next blog, I shall talk about more use-cases of CHEF. Is there a reason why you didn’t create IAM users, add the key for each user there, and then include the ssh_users cookbook that Opsworks provides? Well. That is an approach which you can definitely follow. That would require you creating an IAM user for every user whom you wish to give access to the servers. It’s killing the traditional way and adds dependency onto an AWS service. 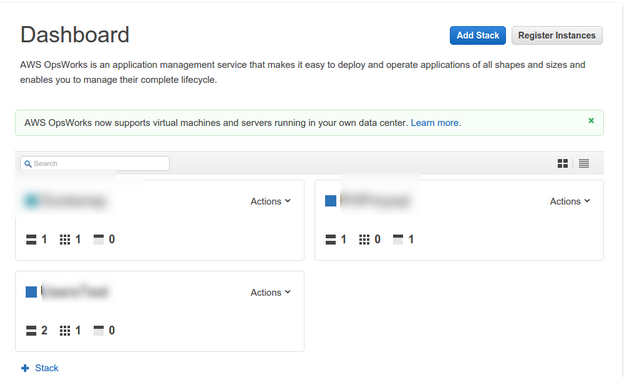 Also, the servers which you add to a stack, these IAM users will have access to every one of those servers. So, that is another reason for not using IAM users. Using a self-made cookbook helped me do the things the way I wanted and remove any ambiguities.